This ink is one of my absolute favorites from the R&K line. In terms of color, it sits between PR Burgundy Mist and Arabian Rose. It’s one of those dusky mauve sort of burgundy colors. In fact, I’d say it’s probably one of the closes interpretations of a wine stain that I have come across thus far. It’s not a super saturated ink, but it also isn’t watery. 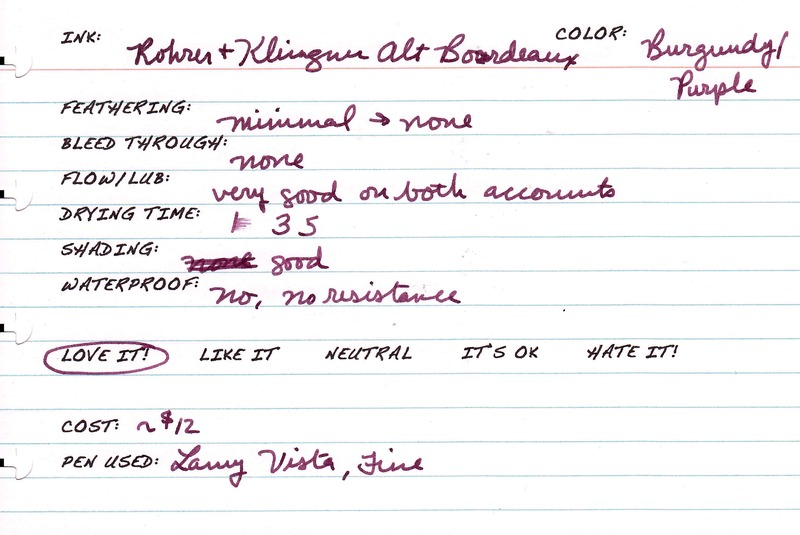 Alt-Bordeaux is an all-around excellent ink with good behavior, excellent color, and a good price. I highly recommend it! Minimal to no feathering depending on the paper quality. Unfortunately, it is not waterproof. This sample was sent to me for review my Ryan at Pear Tree Pens. I am not otherwise affiliated with them. Nice ink, a little more purple than Diamine Syrah.